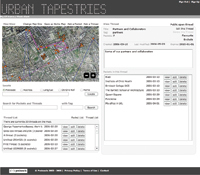 Urban Tapestries is the name of a research project and experimental software platform for knowledge mapping and sharing – public authoring – conceived and developed by Proboscis in partnership with collaborators such as the London School of Economics, Birkbeck College, Orange, HP Research labs, France Telecom R&D UK, Ordnance Survey. The original research project began in late 2002 and was completed in Autumn 2004, with a follow-on research programme of experiments with local groups and communities called Social Tapestries starting in April 2004 and completed in Summer 2007 (additional publications and outputs will be released in 2008). The Urban Tapestries software platform enabled people to build relationships between places and to associate stories, information, pictures, sounds and videos with them. It provided the basis for a series of engagements with actual communities (in social housing, schools and with users of public spaces) to play with the emerging possibilities of public authoring in real world settings. The projects are documented in a variety of ways - from essays, project reports and academic papers to videos, installations and software (interfaces and code) - many of which are listed below. Between 2004 and 2006 Proboscis rebuilt Urban Tapestries into a platform to support various Social Tapestries projects. 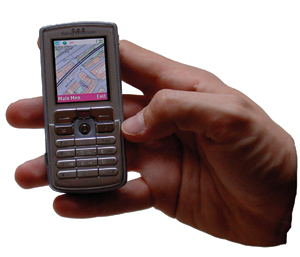 In June 2006 we began using the new system with several communities such as residents of the Havelock estate in Southall, St Marks housing cooperative in west London and for several tests of the pollution sensing feral robots of the Robotic Feral Public Authoring project. The software platform is no longer supported or maintained for use with communities or in public settings, but limited access for research purposes may be possible. 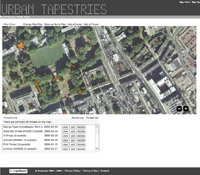 The website and links to the original Urban Tapestries research project can now be found at http://research.urbantapestries.net.